Coaster Photo – A rooftop patio is being constructed on top of the Berkeley Oceanfront Hotel and should be open n two weeks. 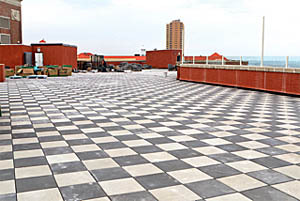 The Berkeley Oceanfront Hotel in Asbury Park is adding another amenity to the landmark building: a rooftop patio. Pilley, lives at the hotel with his aptly named dog, Berkeley, and is responsible for keeping the entire building in good working order. “I never have a day off,” he said. Pilley says since he came on board two years ago, he has seen improvements in the building itself and with some updating and the addition of new meeting rooms, many more weddings and events are being booked. “The building had a lot of issues that are now fixed,” he said. The new patio will offer guests and visitors a spectacular view of the Atlantic Ocean in a comfortable setting with chairs and lounges. Pilley said the next step is building the furniture and staging the area before it opens in two weeks. Eventually, he said, when the new managers take over the ground floor restaurant, food and beverages will be allowed on the patio. Hotel General Manager Sam Haigh said they are in final negotiations with a new restaurateur and if all goes well, it will be open for Memorial Day. Pilley said the space will be available for weddings as well. Pilley ended up in Asbury Park after working at a hotel in Charlotte, North Carolina owned by the same company that owns the Berkeley. He grew up at Virginia Beach and although he is used to living at the beach, he admits getting used to being a northerner took some time. He and his dog Berkeley, a nine pound Shitzu, are regulars at the Wonder Bar’s Yappy Hours and he says Berkeley gets more attention when they take walks on the Boardwalk than he does. “Everybody knows Berkeley,” Pilley says. Pilley has become active in his new hometown, participating in Chamber of Commerce events.